The monthly retainer model introduces a new way for advisors to structure their business models, making it possible to profitably serve younger clients who don't necessarily have large portfolios. 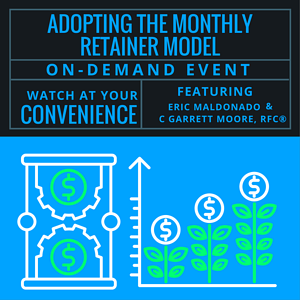 Two great XYPN members will discuss how the monthly retainer model enables RIA owners to work with Gen X & Gen Y clients, how to craft the model to work for an ideal client, and how to build a successful, profitable firm around this new paradigm. This call is ideal for anyone considering XYPN membership. What ongoing relationships look like with clients on the monthly retainer model. How to list the monthly retainer model in your ADV. Does the monthly retainer model appeal to a certain age demographic? How to determine your monthly fee? What tools are helpful when adopting a monthly retainer model? Does Monthly Pay Mean You Have to Talk with Your Clients Monthly? After graduating from Northwood University with a degree in Finance, C Garrett Moore, RFC®, joined Moore Financial Management, Inc., a practice founded by his father over 30 years ago. For over 10 years, Garrett worked alongside his mother and father, and has carried on the family tradition since their retirement in 2016. After visiting an AIDS orphanage in Uganda with his parents as a child, Garrett realized his passion for helping people make the most of their blessings. He's been doing just that for the past decade, helping people plan for their financial futures by investing with their values. Eric Maldonado, CFP®, MBA, CKA® is a San Luis Obispo, CA fee-only financial planner serving clients locally and virtually. Aquila Wealth Advisors specializes in working with business owners to provide faith-based financial planning and values-based investing.